Animal experimentation is a highly emotive issue that is seldom out of the headlines. Millions of people throughout the world oppose animal tests on moral grounds, while the vivisectors themselves insist that animal experiments are vital for medical progress. Without such experiments, the vivisectors say, human lives will be lost: such an argument sounds persuasive. But is the truth as simple as this? Is vivisection really essential for the betterment of human health? Or is the truth quite the opposite – that the results from animal experiments are at best useless, and at worst dangerous? And are the vivisectors trying to keep this from us? 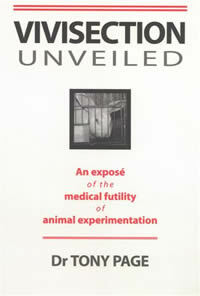 Tony Page has been researching the facts about vivisection for a number of years. Drawing on conference papers and many other sources, his book unmasks the true nature of animal experimentation, presenting a startling collection of sound scientific evidence to show that it is not only valueless but actually poses a threat to human health. And he goes on to show that many scientists who experiment on living animals actually know this, and admit it to one another when they think the world is not listening.